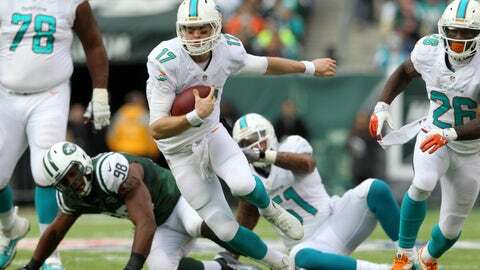 Ryan Tannehill would like to repeat his performance from the game against the Jets in New York on December 1 when he threw for a season-best 331 yards and two touchdowns. Few could have envisioned the Miami Dolphins having a chance to play in the postseason during the firestorm of media attention afforded the Jonathan Martin-Richie Incognito bullying scandal. The New York Jets, meanwhile, may be preparing for a future without Rex Ryan as they miss the playoffs for a third straight season. The AFC East rivals close out the season Sunday in Miami, where the Dolphins need a win and some help to end a five-year playoff drought. Miami (8-7) put aside one of the biggest subplots in the league this year after a 22-19 loss to previously winless Tampa Bay on Nov. 11. The Dolphins won four of five after that defeat but came completely undone last Sunday with a chance to help themselves. Losing 19-0 at Buffalo, they amassed only 14 rushing yards and 103 overall while allowing a season-high 203 on the ground in their worst performance of the year. "That’s the worst part — we had everything in front of us," safety Jimmy Wilson said. "We knew how important that game was, and to drop it like that without getting points or making impact plays or giving ourselves a chance to win is a big letdown. We just have to get ready for a home game and go ahead and finish our season the right way." The running game — or lack thereof — may make or break the Dolphins. Losing both Martin and Incognito decimated the depth of the offensive line, and Miami has rushed for 22 or fewer yards on five occasions. The Dolphins ran the ball only 12 times versus the Bills, and while they did gain 125 on the ground in a 23-3 road victory over the Jets on Dec. 1, offensive coordinator Mike Sherman has yet to fully trust his backs and give them the ball on a consistent basis. "Of those 12 carries, our longest run was 3 yards," Sherman said as he prepares to face a Jets run defense that yields a league-low 3.3 yards per carry. "A lack of productivity in the run game caused me to veer off into another direction." The lack of a ground game has at times hindered quarterback Ryan Tannehill, who was battered at Buffalo, absorbing seven of Miami’s league-high 58 sacks allowed. With another solid performance against the Jets — he threw for two TDs and a season-high 331 yards Dec. 1 — Tannehill could give Miami a chance at its first playoff appearance since 2008. "We have to play our best game of the year. It’s a great way for us to finish the regular season," coach Joe Philbin said. "We’ve got a great opportunity." The two simplest scenarios for the Dolphins to clinch a berth are a victory and a loss or tie by Baltimore or a victory coupled with a win by San Diego. While everything is on the line for the Dolphins, about the only known thing at stake for the Jets (7-8) is the uncertain future of their coach. Some could argue Ryan is performing one of his best coaching jobs this season — trying to keep the team competitive with rookie quarterback Geno Smith learning on the fly — but it remains to be seen if owner Woody Johnson and first-year general manager John Idzik will bring him back for a sixth season. If it were up to the players, though, it wouldn’t be an issue. "It’s just one of those things where he really cares about his players," said David Nelson, who caught two TD passes in last Sunday’s 24-13 win over Cleveland. "Players appreciate that. Players know and they respect him for that. They believe in him and they respect him and they play hard for him. "I think it’s just the mutual respect he gives his players." Though some of Smith’s numbers — most notably his 21 interceptions and 55.3 completion percentage — are unsightly, he has set a rookie franchise record with 2,856 passing yards and is second among all quarterbacks with five rushing TDs after his 17-yard scoring dash versus the Browns. Smith’s four TD tosses over the last three games are four more than his previous five games combined, and he has thrown only two INTs in 89 passes while helping New York win two of three. "He needs his time, and I think it’s unfair for anybody to step out and say, ‘Oh, this kid is not having a great year. Let’s look for a new one,’" guard Willie Colon said. "Every player needs time to develop. It’s up to us as a team to get better, up to us as a line to do a better job and let the kid grow up. And, I think he’s doing that." Smith, who was just 4 of 10 for 29 yards and an interception in the loss to Miami, has rushed for 142 yards and two TDs in his last three games. The Dolphins have won six of the last nine between the teams and are seeking their first season sweep since 2009. The Jets, though, have won six of their last eight in Miami, and the last six games there have been decided by a combined 23 points.